EDMONTON, Alberta (AP) The Vancouver Canucks are on their best run since four consecutive victories to start the season. Bo Horvat got the only goal in the shootout and added two assists, helping the Canucks beat the Edmonton Oilers 3-2 on Saturday night for their third straight win. Alexandre Burrows and Sven Baertschi scored in regulation for the Canucks. Drake Caggiula and Connor McDavid had goals for Edmonton. Jacob Markstrom made 42 saves for Vancouver. Cam Talbot stopped 30 shots for the Oilers. 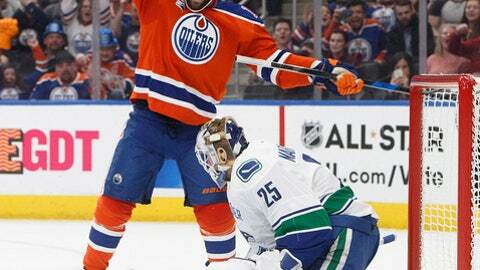 Edmonton caught a break with eight minutes remaining in the opening period when the Canucks had a goal waved off. Markus Granlund picked the top corner past Talbot on a long shot, but a challenge by Edmonton determined that Brandon Sutter had interfered in the crease on the play. Vancouver took the lead six minutes into the second period when Horvat picked off a careless pass by Eric Gryba and the puck ended up on the stick of Burrows, who scored his seventh of the season. The play was once again reviewed for interference but survived the challenge. The Oilers tied the game at 12:31 of the second, just after a power play expired, when Caggiula’s shot from the slot hit Markstrom before trickling in. Vancouver regained the lead five minutes into the third when Baertschi was able to cash in on his own rebound to score his eighth and make it 2-1. Edmonton tied it again with 1:33 remaining when McDavid scored on the power play to tie Evgeni Malkin for the NHL scoring lead and send the game into extra time. NOTES: It was the second of five meetings between the two teams, with the Oilers winning the first game 2-0 at home on Oct. 28. Edmonton has not traditionally fared well in games played on New Year’s Eve, coming into the game with a record of just 2-14-1. The last time they won one was a 4-3 win over the Philadelphia Flyers in Edmonton on Dec. 31, 1985. Oilers defenseman Andrej Sekera missed his second game in a row due to an illness. Oilers: Will hope to snap the Columbus Blue Jackets’ 15-game winning streak on Tuesday in Columbus to start a four-game road swing.